We had a kin event scheduled on Saturday to get a those of us you just finished Volume 1 through the Drums of the Deep (2.5.5) in Volume 2. The instance runs went very smoothly, thanks to Gorandir, Azzbuk, and Mortermeer (from the Weathertons kinship) for helping out. After finishing, Tele, Phebe, and I decided to push on into Book 6. We got all the way to the next big fellowship instance, and we must have been feeling especially motivated because we picked up Berniard from our kin as guide/healer and recruited Thomborn and Mercatio from lff chat. Even with a full party of 65’s and one 64, we wiped twice getting to the end boss but strangely had no problems with the last two big fights. The Cloak of Flame and Shadow dropped and I lucked out to with the roll (which usually never happens). Unfortunately Mercatio was bugged somehow and didn’t get credit. So we may be getting a rematch against 2.6.8 sometime soon. In the end, I stayed up playing until nearly 5 am and finished Book 7 up through Chapter 6. 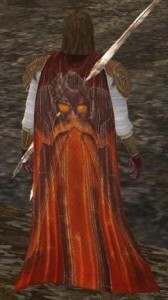 That really is a sweet cloak; I’m glad you won it! And I’m working on getting Phebe caught up to you where you are in Book 8…I think she’s on 7.6 at the moment. We might just get Vol II done before the month is out! Wahoo! Glad you got that far. Lemme know if/when you need help for the others. @Phebe – don’t rush on my account, I’m ok with waiting on you and Tele to catch up. 🙂 My alts are starting to feel neglected anyway I think. I would love to get Volume 2 done before Turbine releases Volume 3, but I don’t remember when that is. @Azz – thanks, I’ll keep that in mind. I’m actually stopped at Book 8 Chapter 3 now since it is a small fellowship quest, and I didn’t want to get too far ahead of Phebe, Tele, and Kelm. Sounds like you’ve been very, very busy. Of course, I’ve heard mostly good things about Volume Two, so I can’t blame you for having fun. I’ve definitely had a resurgence of interest with Mirkwood, but ironically it has been interest in non-Mirkwood content (mostly). I attribute it to finally finding a good kinship to play with. It will be interesting to see how well I can balance my time between LotRO, Champions, and STO in February when STO launches.